← Album review: STATUS QUO – Aquostic II – That’s A Fact! 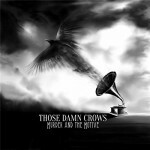 Share the post "Album review: THOSE DAMN CROWS – Murder And The Motive"
Those Damn Crows is vocalist Shane Greenhall, drummer Ronnie Huxford, bass player Lloyd Wood and guitarists Ian “Shiner” Thomas and David Winchurch. They hail from Bridgend, Wales home to the metal beast that is Bullet For My Valentine (that band’s drummer ‘Moose’ Thomas is the brother of guitarist Ian). Overall Those Damn Crows have a definite Alter Bridge feel in the relentless guitar riffs and vocalist Shane Greenhall has a big, strong vocal needed for this type of pounding, melodic metal. They know how to pen an anthem with ‘Someone Someday’ unleashing a torrent of guitar and heavy rhythm on the uplifting chorus. There is a hint of Thunder on ‘Rock N Roll Ain’t Dead’, a song giving two fingers to those saying rock is dead and in ‘Blink Of An Eye’ they have a monster of a riff based song that is screaming to be played live. ’7 Days’ is another riff packed song and the guitars of Thomas and Winchurch combine well throughout the album. Like the QOTSA-like backing vocals on ‘Tonight Tonight’, tasty stuff. This entry was posted in ALBUM REVIEWS, ALBUM REVIEWS (Mobile), All Posts and tagged album, ALTER BRIDGE, Bullet For My Valentine, metal, modern, Murder and the Motive, review, rock, Those Damn Crows. Bookmark the permalink.